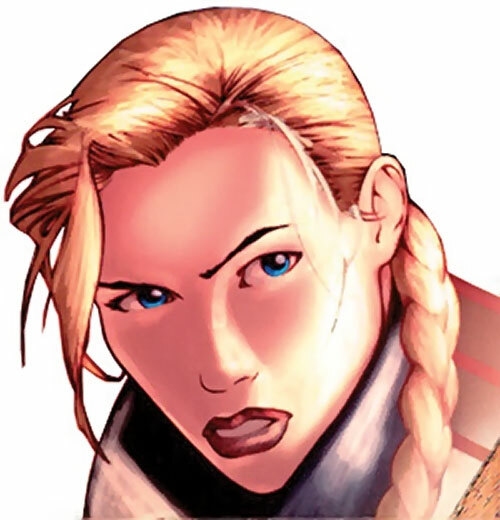 Maya is one of the core characters in the particularly cool comic books series The Red Star, which started in 2000. After a long and costly quagmire in Al’iistan (magical Afghanistan), the Republics are crumbling. Wars of secession are erupting, particularly in Nokgorka (more or less magical Chechnya). Even the mighty Red Fleet and its immense flying firebases (“skyfurnaces”) is not what it once was, and the corruption amidst the State has become too bad to ignore. Real Name: Srss.-Maj. Maya Antares, née Maya Vlasova. Note: Maya is a Sorceress-Lieutenant during the battle of Kar Dathra’s Gate, but has become a Sorceress-Major by the time of the main story, nine years later. Known Relatives: Captain Marcus Antares (Husband, officially deceased), Skymarshall Urik Antares (Brother-in-law), Parents (both deceased, names unrevealed). 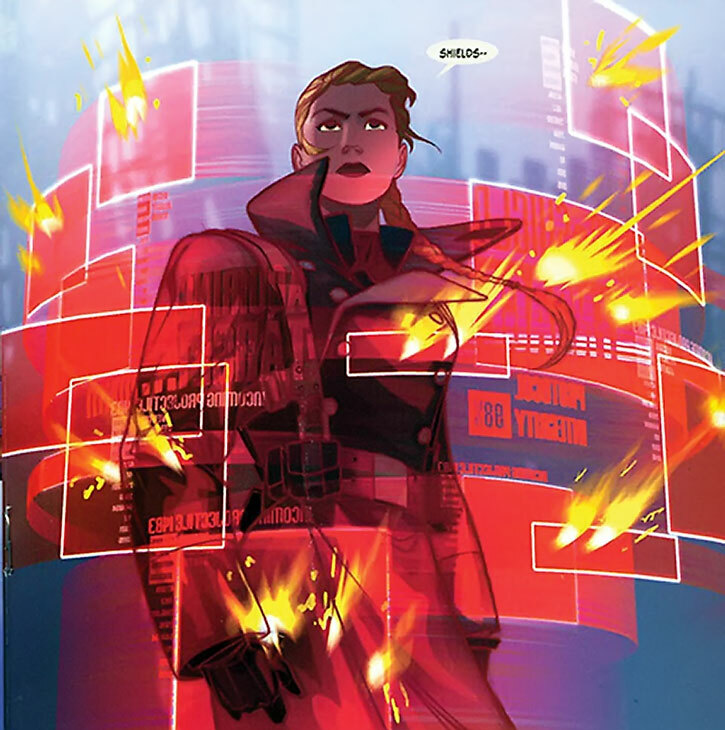 Group Affiliation: Red Fleet, Red Star Sorcery Corps., senior officer aboard the RSS Konstantinov. Base Of Operations: Attached to the Konstantinov. Height: 5’6” Weight: 128 lbs. In the Red Star universe, magic is chiefly a female pursuit. Though other cultures seem to have male sorcerers, the vast majority of magic-wielders (“kasters”) serving the State are sorceresses. 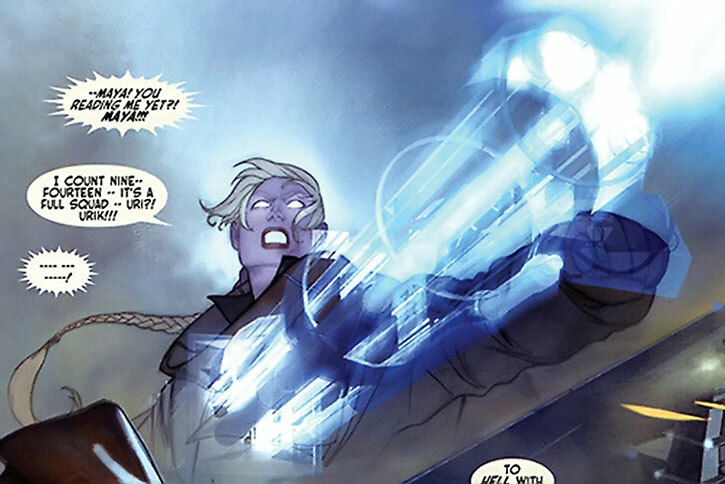 Psionic abilities (which in the comics is mostly a type of telekinesis , though one telepath is also encountered) are apparently possible for all genders. But all the truly proficient psionicists in the story are male. Sorcery and psionics fully interact and likely are two different expressions of the same energy. For instance, Maya is once seen erecting psychic defences to prevent mental intrusion from a male telepath. The source of these energies is eventually revealed in the series. The magic of the United Republics of the Red Star is defined by the bureaucratic witches of the CMIS (Complex of Military-Industrial Sorcery). It relies on pre-defined, pre-formatted spells (“protocols” – in DC Heroes RPG terms these are Rituals), and tends to favour sheer power over the health of the kaster. Though sorceresses are not common, the URRS has a huge population base. Thus magic users, like any other soldiers, are expendable if that achieves an acceptable trade-off for the State. 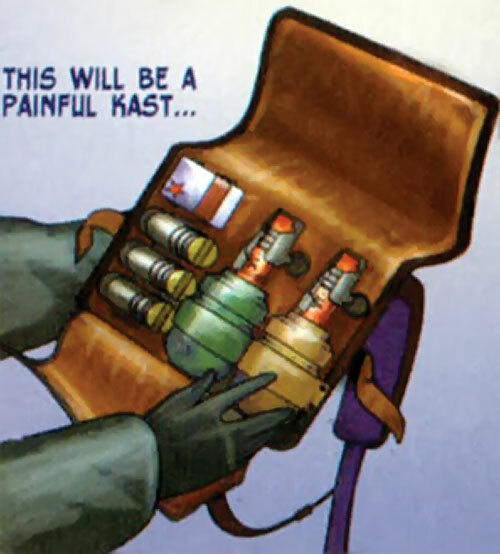 Protocols are painful to kast, in direct proportion to their power – sometimes to the point of having the Half-Fatiguing Drawback (that is, attacking the kaster with half their active APs in DC Heroes terms). Protocols are generally kast by giving orders aloud to the magical energy, as if commanding a spirit. Why Sorceress-Engineers design protocols that way is unknown to ordinary kasters, who do not realise the real source of their power. They simply apply the sequence of instructions they were taught to kast. The chain of command of the Sorcery Corps seems rigid. For instance, the use of advanced protocols must be authorised on the Informnet. This is a psychic network run by infokasters. It behaves much like a secure, undetectable magical radio network. Calling on Informnet officers to kast an advanced protocol is very much like requesting artillery support on the radio. It is unclear whether sorceresses can kast advanced protocols without clearance from Informnet kasters. One gets the impression that Informnet functions much like a huge wireless network. Infokasters seemingly run protocols that make them act as a “relay” providing “coverage” to an area, and “routing” requests from kasters in range. Protocols of all sorts can be “overkast”, imperilling the life of the kaster by channelling too much energy through her body and psyche. It is not uncommon for the order to overkast to be given to strike hard at the enemy, though it will result in friendly-side casualties. Certain weapons such as shipboard isolator cannons essentially overkast each attack. Deployed witches are fitted with real-time medical sensors so their commanding officer can see everybody’s current health. 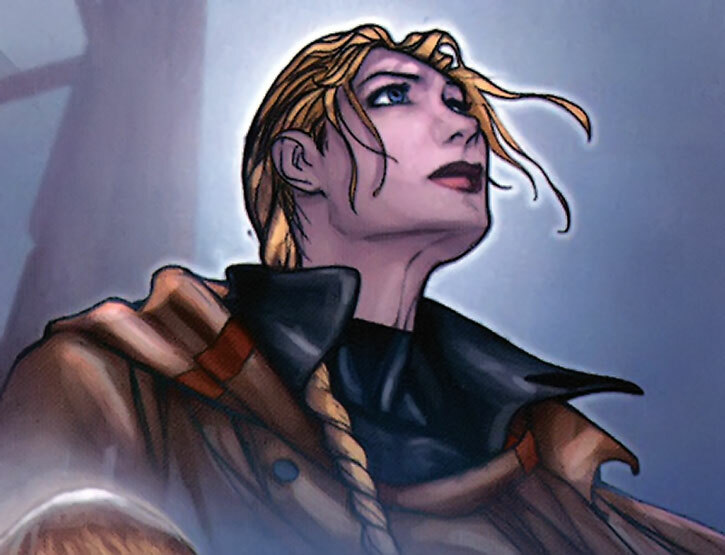 In DC Heroes RPG terms the most powerful Comrade-Sorceresses have both a solid Power Reserve to enhance their protocols (either by normal kasting, or overkasting) and the Hero Points to survive the overkast. Major heroines like Maya even have enough Hero Points to further enhance their overkast, and to keep surviving the punishment from excessive magical stress. To overkast, a sorceress must explicitly and verbally disengage the KPSes (Kaster Physical Systems, also called “KPS wards”) of her protocol. Many protocols (especially advanced protocols) require specific components. From a remark Maya made about “fighting to the last protocol” (which seemed to be a statement of fact, not hyperbole or a metaphor), it would seem that all meaningful ODCPs (Offensive and Defensive Combat Protocols) need components to be kast. And a sorceress can only carry so many even after stuffing her pockets. Components for a given protocol are pre-packaged by the Sorcery Corps in canisters. These usually look like a cylindrical grenade or a large shotgun shell. The sorceress pulls the pin to light the fuse and have the components go live, allowing her to use them in her Ritual. Apparently, the fuse burns the components, making them literal burnt offerings. Components are usually carried in small, padded backpacks with straps to hold the canisters within. 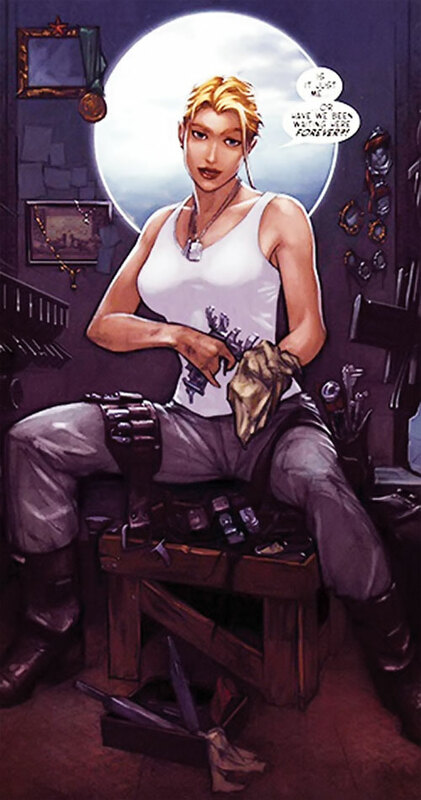 Maya was also seen maintaining components stored on something much like an Old West ammo belt or a bandoleer. Warkasters in the field are assigned a Hailer. This an elite soldier with strong telekinesis serving as their bodyguard, and wielding a specialised weapon system also called a hailer. Hailers on sorceress-protection duty receive the specialised rank of Guardsman. Maya’s assigned Hailer is her friend Guardsman Kyuzo, widely thought to be the deadliest Guardsman on the Fleet. Flashbacks show that magic used to behave differently. For instance during the Revolutionary War (presumably during the 1910s), magic-users were called “summoners” and had a very different relationship with magic. 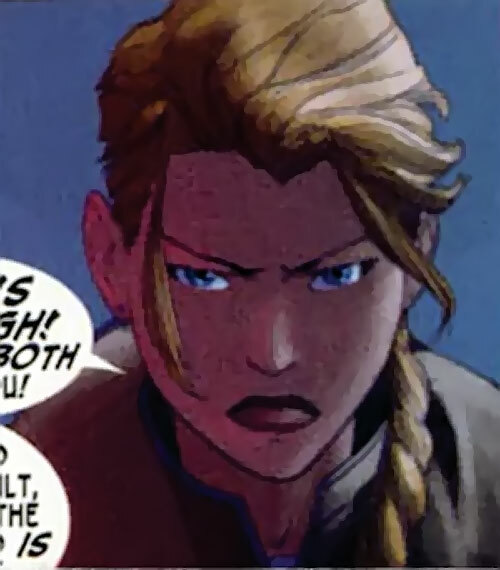 Likewise the magic of the shamans of Al‘istaan works differently (and is inspired by a religion loosely resembling early Islam), Gorka rebels have priestesses that do not work magic quite like Red sorceresses do, and so on. Maya is a Red Sorceress, and significantly more powerful and resilient than most. Her body and mind can withstand enormous concentrations of magic. For instance Maya emerged in pretty good shape from full-length isolator duty, which has a 1:30th survival rate. She once survived an overkast that would have killed any three average witches. Though she comes across as gentle and soft, Maya operates on a heroic level of toughness, determination, perceptive power and intuition. 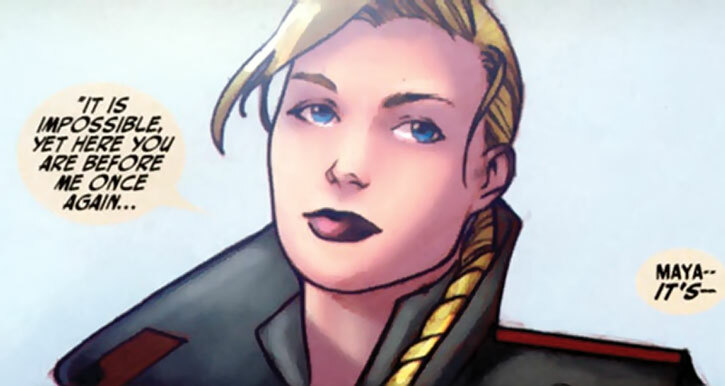 Albeit she never was a hand-to-hand combat specialist and does not appear to pack, she’s also a proficient soldier and commanding officer. Antares is a warkaster, trained in ODCP (Offensive and Defensive Combat Protocols) – as opposed to magic-wielders in supporting roles such as infokasters, supply kasters, medikasters, Sorceress-Engineers, etc. She’s also an experienced sorcery officer. Thus, she can competently command units of kasters outside of her own speciality. She knows how their protocols, procedures and instruments work. 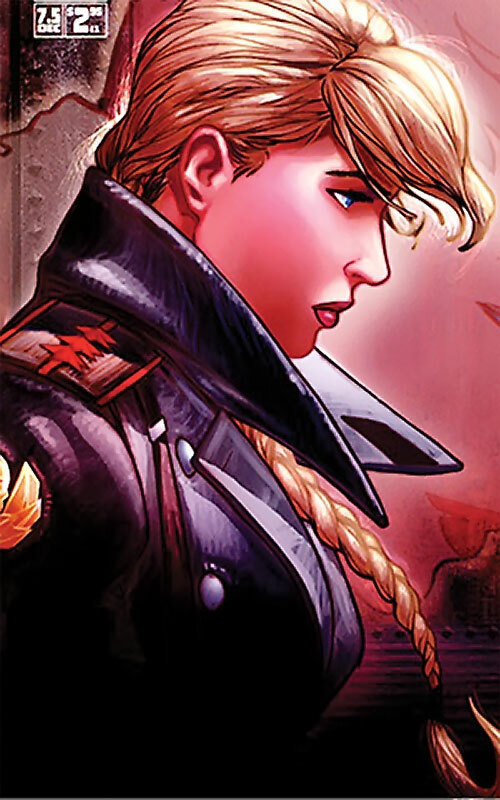 As a Sorceress-Major, she commands all kasting units of the RSS Konstantinov. From context, the ship seems to be about 800 witches strong. 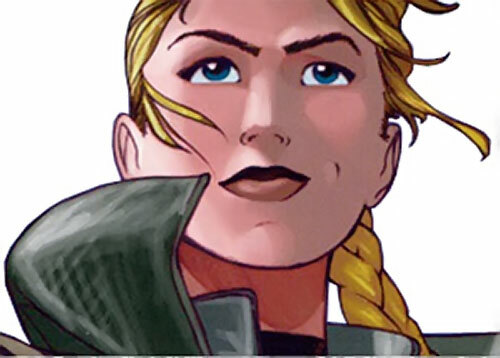 Her second-in-command is Sorceress-Captain Kharkova, apparently an infokaster. For a detailed and illustrated description of her spells, see the game stats section. Maya Vlasova was orphaned at age 11. The State then had her transferred to the Zhinsk Special Orphanage. Reputed for its tough, merciless regimen, Zhinsk SO trains orphans with magical potential. Maya was her cohorts’ valedictorian. She thus was selected to join the Citadel Military Academy’s warkaster training program. Maya was put on the junior officer promotion track. Citadel seems to be the best academy of the nation, training the future cream of the Red military. It is the United Republics’ West Point . Even as a young adult and a Cadet, Maya was considered a weirdo. In some ways, she still behaved like a child. She spent a lot of time daydreaming and/or devouring illegal swords-and-sorcery novels and folk tales compilations. Maya naïvely didn’t quite get realities such as men – since the Zhinsk SO raises future kasters, she presumably grew up in an all-female environment. However, her status as a hotshot warkaster protected her from most disciplining. And her beauty and niceness made her haphazard social skills come across as being charming rather than awkward and nerdy. At the Academy, her best friend was the far more grounded and rough-and-tumble Alexandra Goncharova. 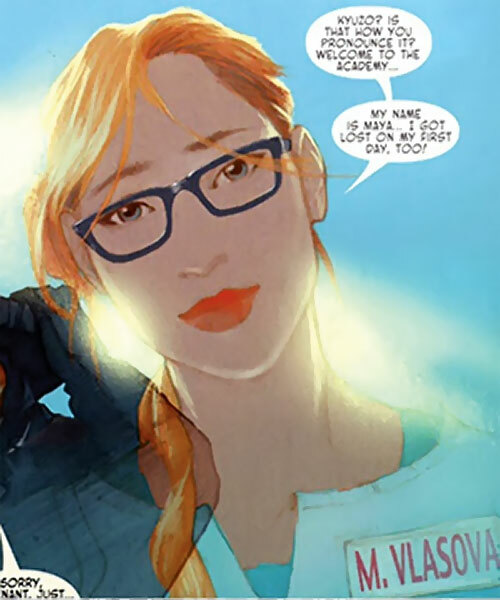 Maya’s shyness and lack of engagement with real life resulted in Alexandra also serving as a go-between when the star student of Citadel Academy, Marcus Antares, expressed an interest in dating Maya. Both Marcus and Maya were romantics and avid readers of banned fairy tales. They almost immediately bonded as a couple. A small group of talented friends formed around Maya and Marcus – including Maya’s future Guardsman, Kyuzo. Maya and Marcus married right after graduating. Urik Antares, Marcus’ older brother by 5 years. Urik is the commanding officer of the immense ship on which the main story take place, and arranged to have his little brother and his friends all serve on his ship. Maya Antares, née Vlasova. 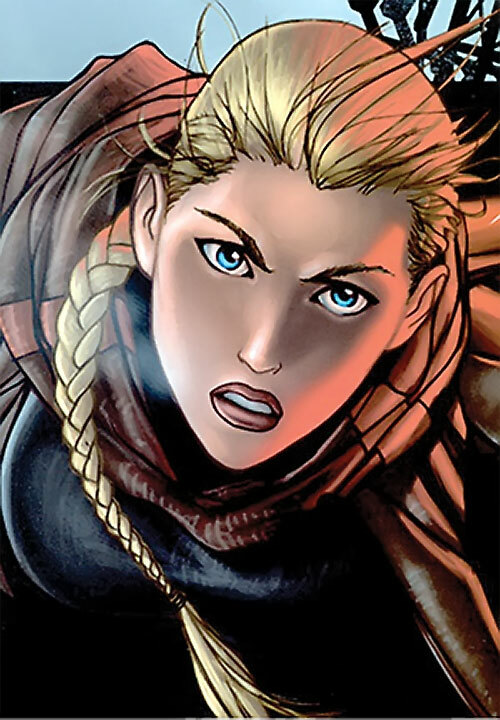 A potent military sorceress (“kaster”) who married Marcus after graduating from the Citadel. Kyuzo. A dour and deadly telekineticist and shock trooper. One of Marcus’ comrades-in-arms, and Maya’s Guardsman. The oldest member of the small Antares clique, Urik, was already a senior officer by the time the rest graduated. A gifted leader, Urik understood the need to have the best possible command staff. He decided to have his little brother, sister-in-law and other friends assigned to him. This was against the procedures. In particular there existed regulations about married couples not serving within the same unit. However, Urik Antares possessed infernal charm and persuasive ability. Thus, he smooth-talked his hierarchy into agreeing – provided that he prove that it was worth it. This test took the form of a deniable mission against the heavily-defended base of an arms merchant. The Antares clique posed as mercenaries. This diversion was meant to facilitate a one-man raid by Kyuzo to destroy two massive ground-to-air cannons that had been hindering a Red Fleet campaign. The cannons were destroyed. But the rest of the mission took a bad turn when Maya realised that the arms merchant, a powerful and feared telepath called the Mute, knew that they were undercover Reds. The Mute took a liking to Maya, cryptically telling her that he knew that she subconsciously realised the true nature of magic. The puzzled Maya and the rest of the team narrowly managed to get out of the base, pick up Kyuzo and run like hell. This success allowed Urik to have his friends and family transferred to his command. He continued to rise in the ranks, becoming a Skymarshall commanding no less than the RSS Konstantinov, a highly respected skyfurnace. Most of his more junior friends made it to Captain. Maya, on the other hand, remained a Sorceress-Lieutenant for years. This was presumably due to her lack of interest in climbing the ranks. As a Srs.-Lt., she commanded a section of 30 sorceresses but still served in the field, including isolator duty whenever her section was assigned to this high-casualty detail. The Konstantinov served in the disastrous battle of Kar Dathra’s Gate, during the Al’istaani War. Early on, the Red Fleet expected a mop-up operation against markedly inferior forces. 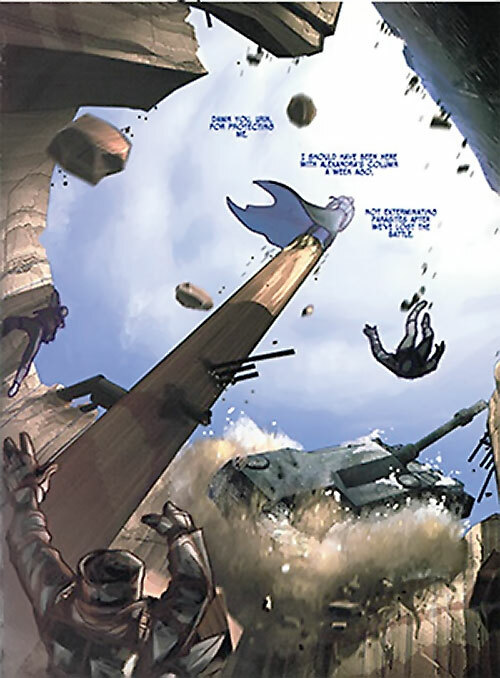 But the situation was brutally reversed when the shamans of the One True God powered a staggeringly powerful spell using the souls of the Al’istaani warriors massacred by the Red Fleet. Infantry Captain Marcus Antares, by now an acclaimed war hero often seen as the perfect Red soldier by allies and enemies alike, was on the ground at Kar Dathra. He was reported KIA. The Konstantinov survived the Al’istaani shamanistic counter-attack, and the semi-hysterical Maya made her way to the ground. She searched for her husband amidst the ruin and carnage. 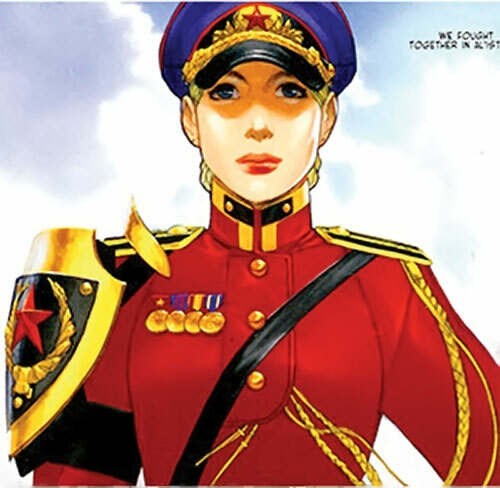 Captain Goncharova was also on the ground with her krawl column. She had been angling to find Marcus before Maya could leave the Konstantinov. Alexandra thus stumbled upon Maya during the retreat. Though the Sorceress-Lieutenant seemed collected, her old friend realised that she was actually out of her damn mind. Alex punched Maya out to prevent her from running to her death to look for Marcus. Several years after the disaster in Al’istaan, the Konstantinov served in the interminable campaign to crush the separatists of Nokgorka. She was deployed over Bahamut, the Gorka capital – or rather the ruins of the Gorka capital. Despite its greater firepower, the Red military had never really made progress against the Nokgorka Resistance movement. Furthermore, the Red Fleet never really recovered from either Al’istaan – or the encroaching corruption and decay at the highest levels of the State and high command. The Red soldiers were now less well-trained, less disciplined, less driven, less well-armed and less telekinetically accomplished than in previous years. The Gorka fighters, in contrast, shared a sacred fire. Though they were disadvantaged in most things material they kept miring their former countrymen in a bloody stalemate. Likewise, neither Maya nor Urik Antares had recovered from the apparent death of Marcus. Though both remained brilliant officers, Maya became increasingly distant and lost in her grief, and Urik started drinking. During an armoured raid in Bahamut, Alexandra Goncharova’s krawl column found itself trapped and surrounded. Their flanking columns had been stopped by the resistance, leaving Captain Goncharova and her troops in an untenable spearhead position. Alex’s crews savagely fought off the Gorka and continued their retreat after dismounting, but were hopelessly outnumbered. During the fighting Goncharova repelled Makita, a teenaged Gorka war heroine who tried to kill her in melee combat. Unable to blow off the head of a kid, Alexandra was shot dead by Makita’s allies after sparing her life. This left the young Gorka badly shaken and questioning her black-and-white worldview. Makita buried Goncharova as she could once the fighting was over. Further devastated by the loss of her best friend, Maya had a bitter fight with her brother-in-law. She left to walk alone into Bahamut to find Alexandra’s corpse and bury her friend. Half-drunk but realising that Maya just wanted to die, Urik refused to commit forces to recover her in the middle of bandit turf. However Maya’s Guardsman, Kyuzo, discreetly disobeyed as Maya and Urik both knew he would. The deadly Kyuzo shadowed Maya through Bahamut, taking out all the Nokgorka Resistance snipers before they could shoot. Maya also ran into well-armed looters, though they were no match for an elite Red sorceress and she killed them off. Reaching Alexandra and Renko’s last stand, Maya was puzzled to find a makeshift grave for her best friend. She kast a powerful reenactment protocol to determine what had happened, and started experiencing a nervous breakdown upon witnessing the scene. The ghostly re-enacted scene also shook the nearby Makita, who had been tracking the Red down to kill her after all her snipers had failed. Makita attacked, but was too shaken. The kid faltered against Maya, who had Kyuzo hold his fire. Neither Makita nor Maya could harness enough hatred to fight, and Makita spotted Maya’s name tag on her uniform. To her shock, the girl realised that a letter her father had recently entrusted her with was addressed to the Red sorceress standing before her. The content of this letter would change the fate of the Motherland. Maya Antares is an exceptional Slavic beauty, with silky pale skin and large, very blue eyes. When kasting, her eyes glow white hot. Maya is a big-time romantic and a mystic in the Russian tradition. She has read a lot of banned books about folk tales and mythology. Her dreams are filled with romantic destinies, handsome knights in shining armour, fairy tale witches, heroes triumphing at the end, primordial forests, wise wolves, chicken-legged huts and the like. She always saw Marcus as her own Prince Charming. Outside of battles and crises, Maya is generally quiet, nice and soft-spoken. Her love for Marcus is the keystone of her life. Her tranquil commitment to him and his memory is nigh-mystical in intensity. She is also highly devoted to the State and the Motherland, and her patriotism is one of the few things that can lead her to anger. Though she’s a harsh, tough fighter and commander with an impressive endurance and determination, Maya generally comes across as gentle, soft-spoken, calm and unassuming. She is a dutiful, proper daughter of the Revolution. Her mystical streak often leads her to daydreaming about myths and stories rather than having a life. However she experiences very strong emotions about subjects she cares about, which may lead to irrational actions out of emotional turmoil such as her grief for her dead friends. But even in the middle of those irrational, quasi-suicidal episodes to cope with the main tragedies of her life, she remains oddly collected and competent, as if actually in control of the situation. Maya has something of a self-sacrificing streak, and seems more or less looking for a way to sacrifice herself for the greater good. This becomes particularly evident after Marcus’ reported death. She nearly managed to get herself killed on several occasions since. Presumably this is the result of the tension between her willpower and her inability to continue living without her great love. This tendency to take great risks in the name of the greater good worries her friends and makes them overprotective of her. The friendship among the cast members is an important theme of The Red Star. They share a very strong bond and mutual respect. Though this shared relationship nearly destroyed Maya over the years as she lost her husband then her best friend. It is also what kept her alive – quite literally. Int: 05 Wil: 04 Min: 06 Occupation: Srss.-Maj.
Power Reserve is normally used to either increase the Range, Volume or Duration of Rituals – but it can also increase Maya’s RV against magical stress and backlash from Rituals she kasts, helps kast, or overkasts. Power Reserve can also be used to overkast a Ritual. This allow for boosting the Ritual’s primary scores (AV, OV, EV, RV) with Power Reserve, but these APs of Power Reserve become Killing Fatiguing at the end of the Phase. Once APs of Power Reserve are assigned to a Ritual (either normally or as an overkast), it becomes possible to spend HPs to bolster the effect (in the case of an overkast) or Push the effect (for normal kasting), using the APs of Power Reserve assigned to the Ritual as the base value. For instance 4 APs of Power Reserve used to boost the EV of a protocol allow for further boosting the EV by four APs through HP spending. In the Red Star universe, Rituals used via Occultist cannot benefit from Hero Points spending in normal circumstances. HPs can be used through Power Reserve as above, though. Buddy (Kyuzo), Credentials (Red Fleet, Low – lost after the mutiny and replaced by High Credentials with the crew of the Konstantinov), Familiarity (Red Fleet equipment and procedures ; Heroic fantasy and fairy tales ; Sorcery Corps magical protocols), Iron Nerves, Luck, Rank (Srss.-Maj.), Sharp Eye. Skymarshall Urik Antares (High), Makita (High). MIA toward Romanticism, Dependent (Marcus, 0 pts). In her youth Maya is seen wearing glasses – either she needs them to read or her eyesight was since fixed. 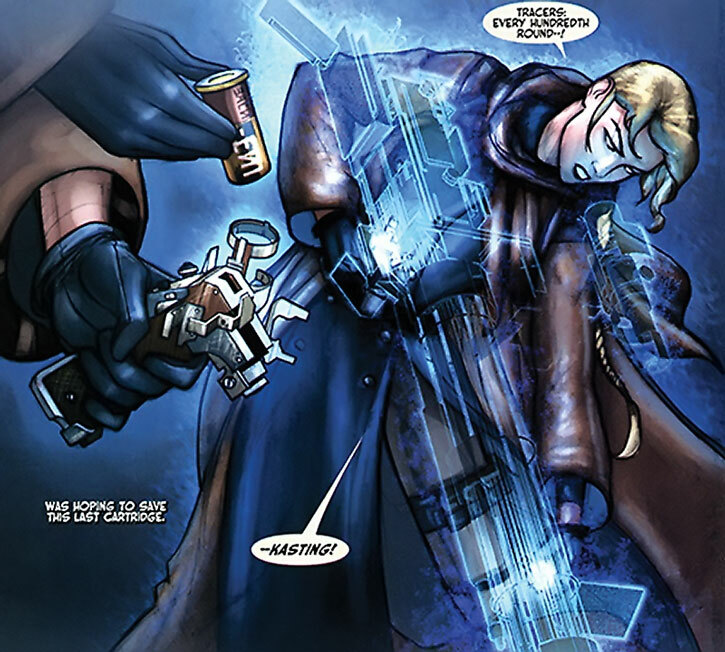 As a young officer Maya carried and occasionally used a regulation handgun, but as her power increased she apparently stopped packing to carry more protocol components. The Rituals Srss.-Maj. Antares was seen kasting have their own sektion. [Sorcery: 00, Casting time: 1 Phase, No or negligible components, Limitation: the GM can veto having Sorcery mimick a Power that’s not in-genre]. These are very minor manifestations of magical power. 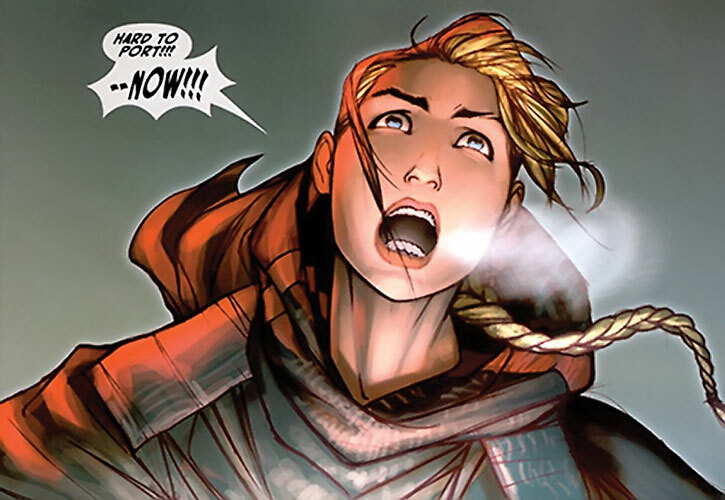 An early example in the comic is to manifest a small flame in her palm. Aged veterans of the Red Fleet consider it good luck to have a comrade-sorceress light their cigarette that way (Flame project: 00). Another example is to interact with magical subsystems of some high-end pieces of equipment. 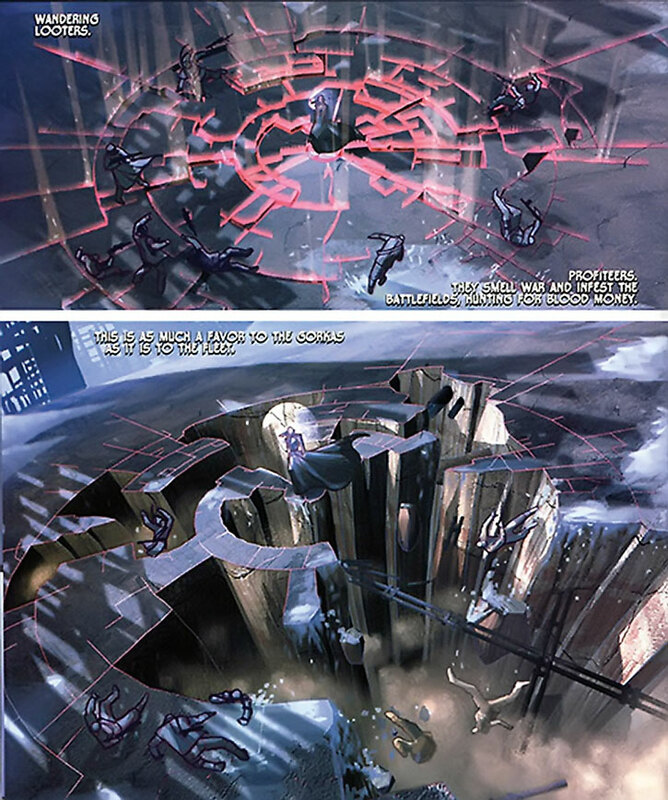 It allows a kaster to summon a sort of interactive magical HUD to monitor and control the systems more quickly and efficiently than with ordinary computer interfaces (Interface: 00, only with computers with a witch’s interface, plus Superspeed: 00, only to accelerate Tasks through a witch’s interface). Maya once seemed to use a cantrip to emulate 0 APs of Telescopic Vision through Sorcery, but it might just have been her Sharp Eye Advantage. The Ritual for isolator duty (essentially serving as the lens for a giant magical laser used for anti-ship fire). Impact protocols allowing a krawl to survive unarmed in its drop pod after having been dropped in free fall from a Skyfurnace. The various ammunition teleportation Rituals (used to teleport specially prepared ammunition right into the prepared ammo storage of units within range, reloading them in the field and on the fly). Maya also presumably knows teleportation protocols and protocols to set up counter-magic fields to jam enemy communications and scrying – albeit those seem to be team efforts. [Radio communications: 02, Obscure (Radio com. only): 04, Split: 06 (Only to create multiple headsets), Casting time: 1 Phase, No or negligible components]. This create a sort of spectral headset – a translucent white rectangle before her mouth and another before her ear, linked by a thin ghostly line. These are usually used to communicate amongst crew members in an airplane or a krawl, and seem harder to detect than standard radio. Magical radio headsets can also interact with the vehicle’s standard radio to function like a normal headset. [Telepathy: 07, Only to connect to Informnet]. [Force field (Self Only, Cannot Attack Through): 05, Casting time: 0, Comp. : Unrevealed, but they almost certainly exist]. This protocol summons translucent red plates of force that orbit around the sorceress. These swiftly rotate along an imaginary cylinder to intercept blows and projectiles. Several of these plates have inscriptions and numbers facing the sorceress – a sort of HUD indicating their current structural integrity and the like. Maya summoned this with but a word (“shields”) but prior preparation to have the protocol ready to go may have been involved. If you are familiar with the kinetic shields Powers used in our Mass Effect articles, these are likely a good alternative Power for this Ritual. [Bomb: 05, Earth control: 08, Casting time: 1 Phase, Comp. : Unrevealed, Drawback: Half-Fatiguing, Notes: Bomb and Earth Control are Combined ; Bomb had No Range (but does not harm the kaster) and Earth Control is limited to removing a volume of ground around the kaster]. This impressive spell shatters then displaces the ground under the sorceress. It is usually kast to leave the sorceress standing on a tiny column of ground with a large, deep, cylindrical pit around her (and a narrow slice of intact ground to walk out). Those caught in the radius of the forming pit must gain RAPs against a 06/06 OV/RV using DEX/DEX or an appropriate Evasion Subskill or fall all the way down. One would assume that this is an advanced protocol. [Disintegration: 04, Casting time: 2 Phases, Comp. : Unrevealed]. This protocol almost certainly has Limitations as to allowable targets (it’s presumably restricted to immobile unliving objects, for starters). It was used by Maya to disintegrate two carbonised corpses. [Postcognition (Discerning): 08, Casting time: 5 Phases, Comp. : One specific canister (see below), Drawback: Half-Fatiguing, Notes: Maya can use her Power Reserve to boost the APs of Postcognition, which are considered Duration APs for this purpose. This is an advanced protocol, and requires a modified flare grenade packed with special components. Being an advanced protocol and linked to Informnet, it has a form of artificial intelligence]. This replays a past scene as a ghostly, life-sized scene all around the kaster, and is usually used as a powerful forensics tool. The witch can give all sorts of verbal instructions to the spell – freeze, rewind, play in slow-mo, locate in the sequence persons known to the Sorcery Corps, display the exact time, re-enact with or without sound (with filters if needed), etc. The spell also has access to Sorcery Corps and Red Fleet databases and can run searches based on verbal instructions. [Projectile weapon: 08, Ammo: 08, Advantage: Autofire, Telescopic vision: 03, Ultra vision: 03, Casting time: 2 Phases, Comp. : MTK-90 components cartridge, MTK-90 grip]. The cartridge (looking like a large shotgun shell) has its grenade-like pin pulled and is inserted on top of a specialised pistol grip. 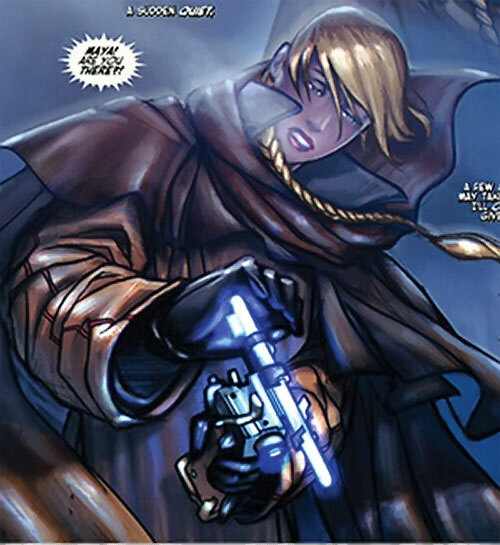 The sorceress then conjures a spectral chaingun, verbally selecting the ammunition, fire rate and optics (which float in front of her face) as she kasts. The spectral chaingun presumably shoots 7.62x54mm R (since it seems based on the real-world Shipunov GShG-7.62 minigun). Yet the recoil doesn’t seem too punishing and the gun can be operated roughly like a squad automatic weapon. Weaponry (Firearms) can be used to fire it rather than Weaponry (Heavy). Maya carries four MTK-90 cartridges and a grip. [EMP: 08, Lightning: 06, Ammo: 01, Bonus: Lightning and EMP are Combined, with EMP affecting anything hit by Lightning, Casting time: 1 Phase, Comp. : Voltage protocol rod, Voltage grip]. This protocol uses a glowing rod (not unlike a slim glowstick) and a grip comparable to that used by the MTK-90 protocol. It unleashes a lightning bolt inflicting direct damage and frying electronics, and is thus chiefly used against vehicles. Maya carries one grip and two rods. 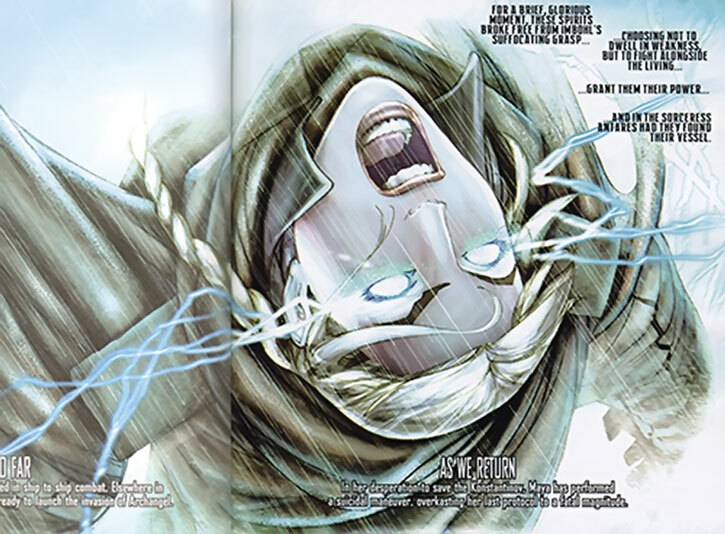 Note that when Maya is seen kasting this in the comics, she overkasts to fatal *and* puts full HPs behind it *and* receives the backing of the Storm of Souls ancestors (who can and do use HPs to boost Rituals), turning a run-of-the-mill protocol into a weapon of mass destruction. [Iron will: 02, Mind blank: 06, Casting time: 5 Phases, Comp. : Unrevealed]. This protocol seems chiefly intended to defend against telepathic intrusion, especially Mind Probe. While the History section stops near the end of the first run of The Red Star, the game stats include protocols Maya is seen kasting in later books (up to The Sword of Truth #3, which is the latest book as of this writing). They do not, however, include her awakening to the spirit realm and gaining the Eyes of Imbohl. 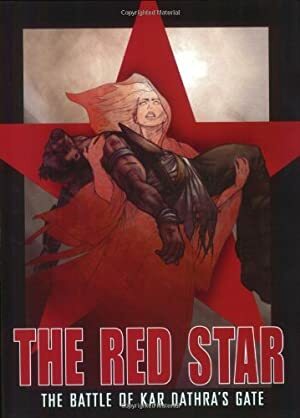 Source of Character: The Red Star comic book. Helper(s): Darci, Roy Cowan. 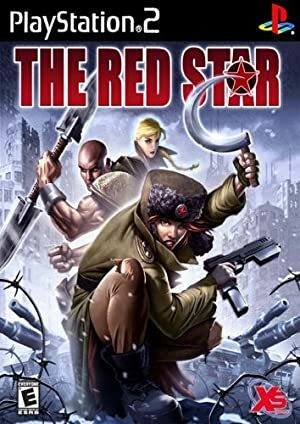 Beyond the comics, the The Red Star profiles on writeups.org use data from the official The Red Star website and The Red Star Campaign Setting RPG supplement by Green Ronin. We’ve checked how canon it is with the fine folks at Green Ronin, who confirmed that all the material was from the notes of The Red Star author Chris Gossett – who also reviewed and approved their final draft. Writeup completed on the 16th of December, 2010.